Your eyes are frequently the focal point of your face and an important aspect of facial attractiveness. The eyelids are critical in protecting the eyeball, maintaining a stable tear film and providing facial expression. The eyelids may become droopy or baggy due to stretching of the tissues which can allow normal fat to advance and create a fullness or thickness of the upper or lower eyelids. This may occur on a hereditary basis, from chronic eyelid swelling, infections, allergies, due to aging, trauma, from various inflammatory conditions, post-surgical changes or drooping eyebrows. 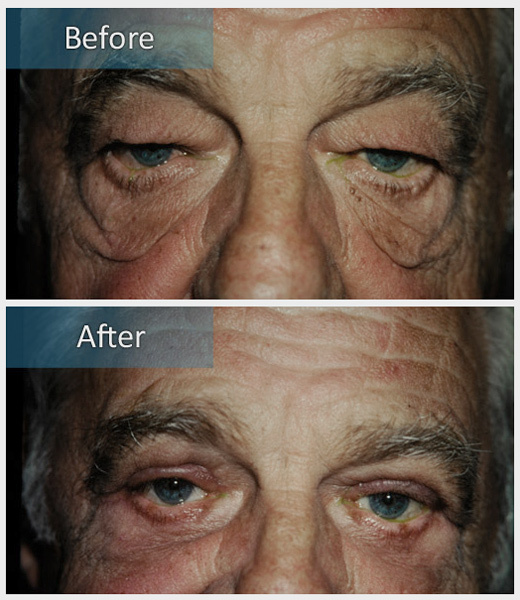 The effect of drooping eyelids may be both functional and cosmetic. The most common functional complaint is that the thick upper eyelid folds obscure driving or reading vision, whereas cosmetic considerations are primarily due to eyelid appearance (tired eyes). Blepharoplasty is the medical term (from the Greek roots blepharon or eyelid and plassein to form, mold, shape) for an eyelid surgery which corrects the drooping or sagging tissues of the upper and lower eyelids. The surgery involves removing skin and fat from the upper and lower eyelids with the goal to debulk the upper eyelid fold, sharpen the crease and restore the lower eyelid concavity. The surgery typically requires incisions that follow the natural upper eyelid crease (midway between the brow and eyelid margin) and are hidden along the inside of the lower eyelid. The incisions blend with the smile lines at the outside corner of the eyelids. Eyebrow surgery may compliment blepharoplasty to restore the natural relationships of the eyelid crease, contour and fold. Blepharoplasty is usually performed as an outpatient procedure under local anesthesia, with sedation if desired. The amount of pain experienced after surgery is variable among individuals; but most people have very little pain, controlled with compounds which do not contain aspirin to avoid bleeding. Eyelid swelling is also variable after blepharoplasty but is minimized by using ice compresses or frozen peas in a ziplock baggie for the first 48-72 hours after surgery. Most swelling and/or bruising are resolved after two weeks, but a small amount may be present for up to six weeks after surgery. There are normally three postoperative visits, the day after surgery to ensure that there are no structural problems, the week after surgery to take out sutures and the month after surgery to take final photos. A general concept is that when skin hits the lashes it bothers people and they are motivated to have surgery. However, insurers typically cover upper eyelid blepharoplasty only if it is causing a functional problem that interferes with your vision. Insurers usually require that the upper eyelid margin or overhanging skin blocks or encroaches the pupil (the dark spot in the colored part of your eye). This may result from an underlying medical condition (allergies, skin inflammations, infections, dysthyroid disease), a familial trait, or prior trauma. Insurers usually require photographs and visual fields to document a loss of vision that improves when the eyelids are elevated before they will consider payment. The lower eyelids rarely interfere with vision and are not typically covered by insurers. The photos above clearly document conditions where nearly all insurers would cover upper eyelid surgery as a “functional” condition that interferes with vision. The lower blepharoplasty (right) was done as a cosmetic procedure in combination with the functional upper eyelid surgery. 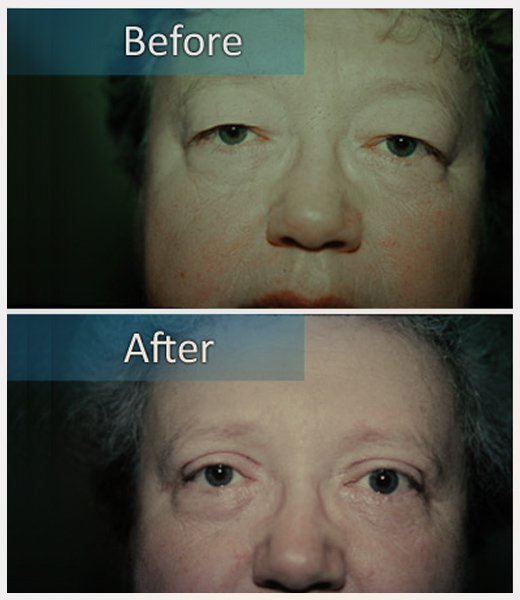 Many patients are motivated for eyelid surgery because they look tired but don’t feel tired. Clearly when upper eyelid skin touches the lashes it creates a “visor-like” effect with a noticeable presence making the eyelids feel droopy. Many female patients desire an “eye lift” to improve options in make-up application, to look more refreshed or less “mean”, and to appear more like they did before the eyelids became puffy. Most men consider blepharoplasty, particularly those in the public eye or sales, to improve their results in the competitive marketplace or to change clients focus to the message and not their physical appearance. The ultimate “look” you achieve depends upon your anatomy, the placement of the upper eyelid crease and the relationships of the eyelid fold and brow. Your choice of upper eyelid fold thickness has a dramatic impact on the final appearance. Many patients are reluctant to consider cosmetic eyelid surgery due to fear of the commonly performed high crease blepharoplasty and brow lift that can result in a “surprised look”. However, Dr Edelstein’s exceptional understanding of eyelid/brow anatomy and surgical skills allows you the opportunity to customize your eyelid crease to a desired level; high, medium or low. The Asian eyelid is a specialty situation that requires even greater attention to detail than a standard blepharoplasty. Dr Edelstein has been performing cosmetic blepharoplasty, cosmetic revisional blepharoplasty, and Asian eyelid surgery for over twenty years. The “Hollywood” blepharoplasty is seen among movie stars, such as: Cher, Dolly Parton, and Kenny Rodgers. You can also see many examples of the high crease blepharoplasty while wandering the higher end shopping malls in your city. It is a “cookie cutter” procedure performed commonly by many cosmetic surgeons. The goal is to create a deep upper eyelid hollow with a high crease and an elevated eyebrow. The Hollywood or high crease blepharoplasty may be appropriate for those with naturally high creases or when a large platform is desired for make-up application. However, when patients have a naturally full upper eyelid fold, the high crease blepharoplasty can profoundly change your look in an irreversible way. Therefore, you must be sure you want this look in advance of surgery and seek a surgeon that offers the ability to match your look to your desired appearance. Please see mid crease and low crease blepharoplasty to visualize the difference. 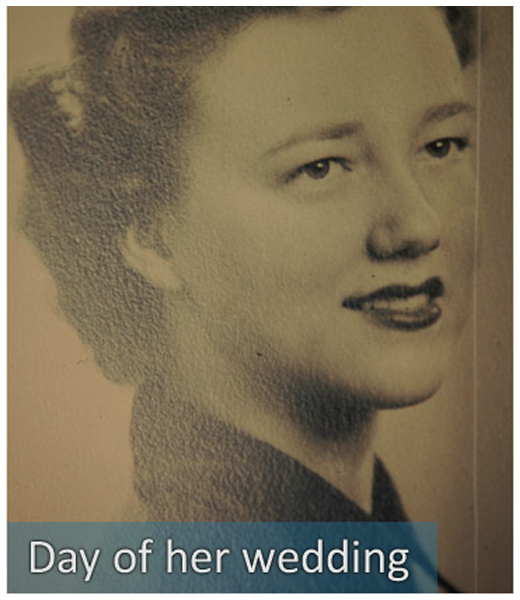 The wedding photo (left sequence above) shows the naturally thick upper eyelid folds in her twenties. Please note that her upper eyelid folds are only mildly thicker with some skin redundancy in the fifty years between her wedding and before surgery photos. 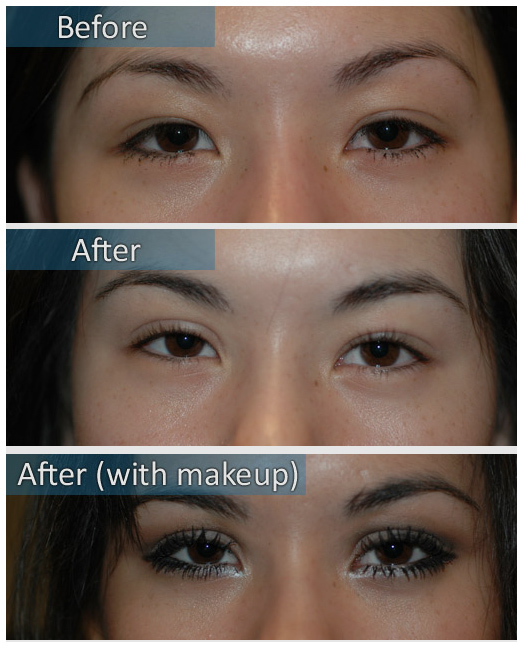 In this case, she always wanted a higher upper eyelid crease to offer more options for makeup application. She was thrilled to have more “open” upper eyelids. 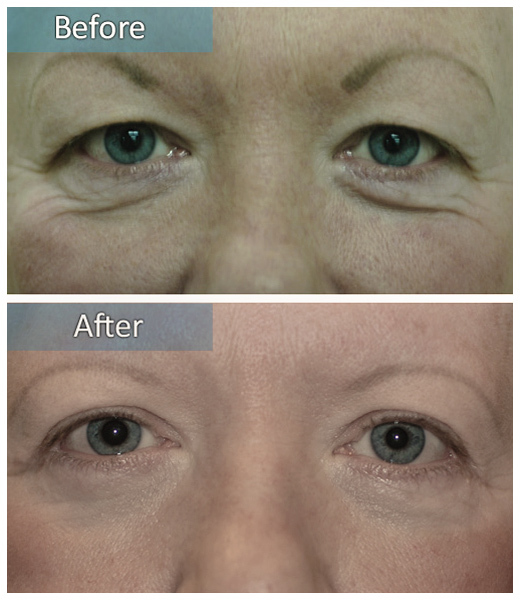 This sequence demonstrates the dramatic change a high crease upper blepharoplasty without brow elevation can have on the look of a patient with naturally thick upper eyelid folds. She also had a cosmetic lower blepharoplasty. 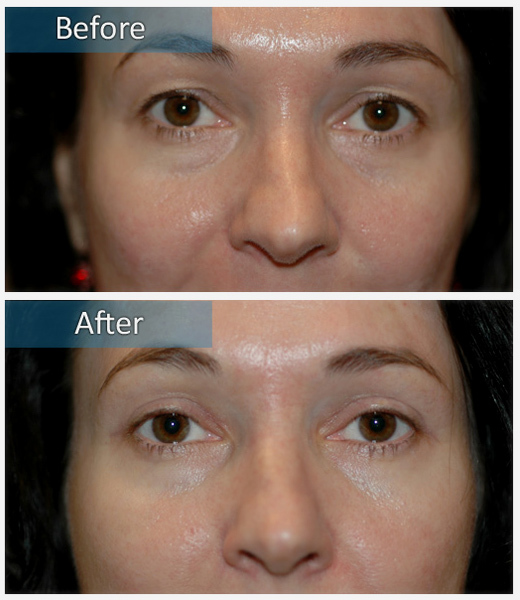 A mid-crease blepharoplasty can offer a natural look without the “surprised” appearance. This approach is helpful for those who have always had naturally thick upper eyelid folds, but have developed excessive fullness causing a tired appearance. 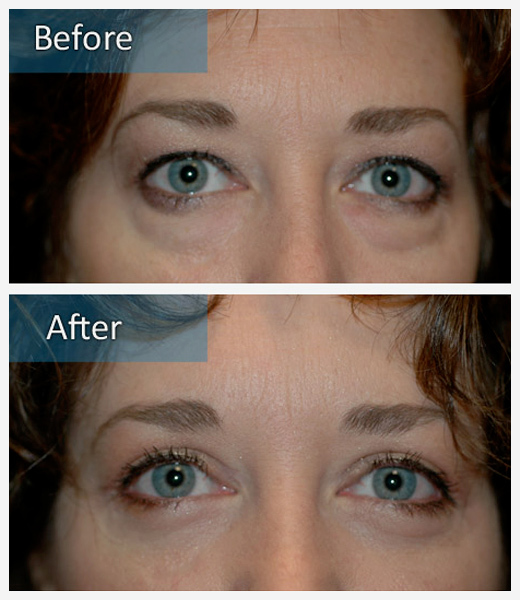 The mid-crease blepharoplasty offers a way to look fresh and less tired, but not look like a different person. It is particularly helpful for most men who desire a more alert appearance without changing their basic appearance. A mid-crease blepharoplasty is designed to debulk the upper eyelid fold, elevate the crease, restore a natural nasal concavity, and support the brow at or just above the bony orbital rim. 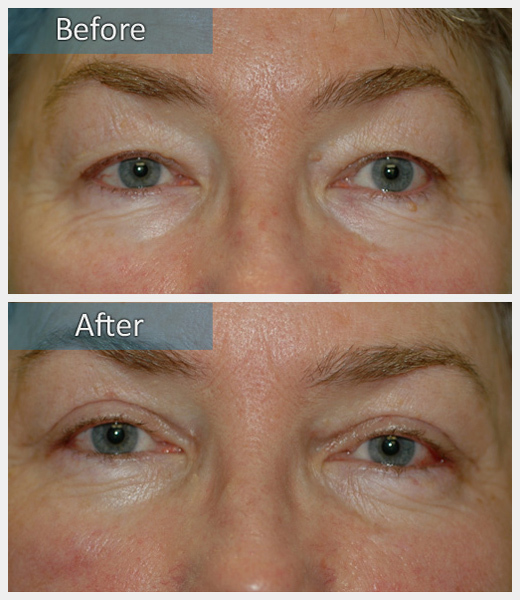 In addition, both photos also show cosmetic lower blepharoplasties. 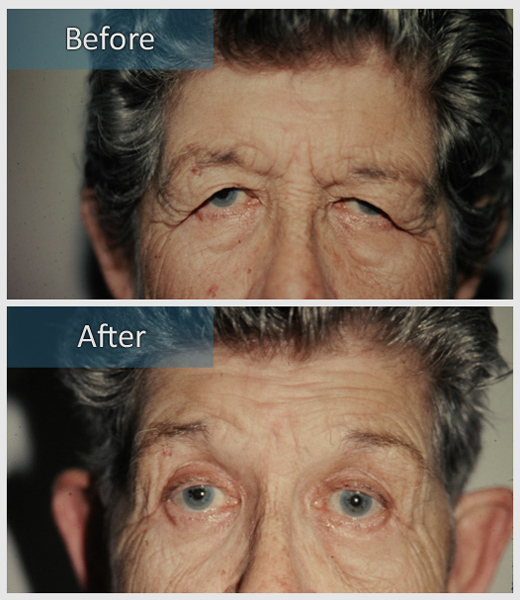 Some patients prefer their full upper eyelid appearance, but desire the more natural appearance of their youth. 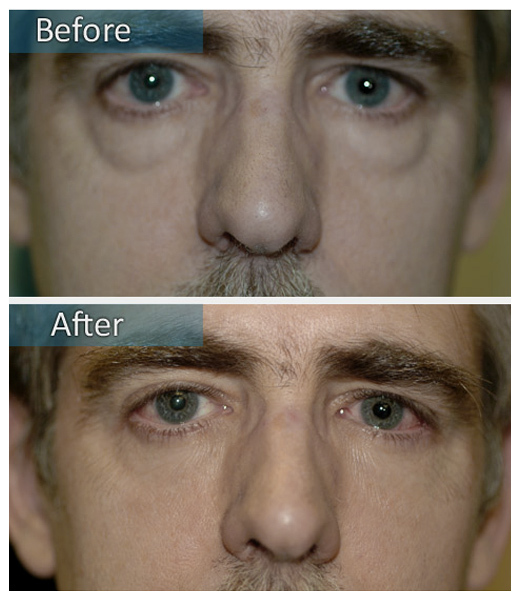 In these cases, care is taken to debulk but maintain the upper eyelid fold with a lower crease and restoring the nasal concavity. She also had a cosmetic lower blepharoplasty. There are three naturally occurring fat pads in the lower eyelid that typically live behind a thick tissue called the orbital septum. When the septum thins due to aging, trauma, or disease, the fat pads may migrate forward causing fullness, or a loss of the natural lower eyelid concavity. In addition, the cheek has a fat pad that rests along the bony orbital rim. When the cheek fat pad descends, a characteristic “backward J” shape is commonly noted as “dark circles” under the eyes. This is NOT the same as the natural pigmentation in dark or olive skinned individuals that can also cause “dark circles”. The tendons support the inside and outside corners of the lower eyelid may stretch causing a loose eyelid with a poor return snap that can turn inward, outward or show the white of the eyeball. The goals of lower blepharoplasty are to debulk the lower eyelid fold, restore the natural concavity, elevate the descended cheek fat pad, keep the lower eyelid margin apposed to the eyeball at a natural height, and maintain a natural angled connections to the upper eyelid. This is typically performed with a “trans-conjunctival” approach where most of the incision is between the eyelid and eyeball. This is a more direct approach and reduces the visible scarring. The “double eyelid” surgery is one of the most commonly requested cosmetic procedures among Asians. This surgery represents a specialty among eyelid surgeons because it demands extreme attention to detail and understanding of the anatomy associated with the upper eyelid creases and epicanthal (nasal) folds. The goals in Asian blepharoplasty are to define the creases, contours, and folds in a way that compliments their natural features. In most cases, this means exposing a space between the eyelashes and eyelid fold, with or without maintaining the nasal fold as desired. In the example above, she wanted to reduce the epicanthal fold and improve her upper eyelid exposure to increase her options for make-up application. Many patients wish to know if their eyelid surgery will be “covered by insurance”. Please understand that each insurer has individual determination policies. While many insurers allow “pre-authorization” for surgical procedures, they commonly state that “pre-authorization is NOT a guarantee of payment”. Please contact the patient advocate at your insurance company to fully explain your current benefits, coverage, and network issues. Medicare does not offer pre-authorization of coverage for any procedure. They operate much like the Internal Revenue Service (IRS) treats your taxes. Medicare will accept insurance claims on face value after the service is rendered, but can audit the necessity of surgery AFTER payment has been made. If the documentation fails to meet their guidelines, Medicare may ask for a return of any payments. Most secondary insurers follow Medicare’s lead whether payments are allowed or returned. If Medicare determines your surgery is not allowable, standard private or “charge master” rates (which are higher than Medicare fees) will apply. When Medicare does not provide coverage (i.e. cosmetic surgery) a private agreement may be made between you, your doctors, and the surgery facility. In this case, a discounted rate is given for a “cosmetic package” compared to the standard or “charge master” rates. In order to help our patients understand their financial commitment, we offer a written cost estimate in advance of your planned procedure. “I have no suggestions, only compliments. The young ladies out front were excellent. Dr. Edelstein was polite, professional and made my eye surgery a great experience. I found himi to be a very nice person, even though he is a “Packer Backer.” Thank you.